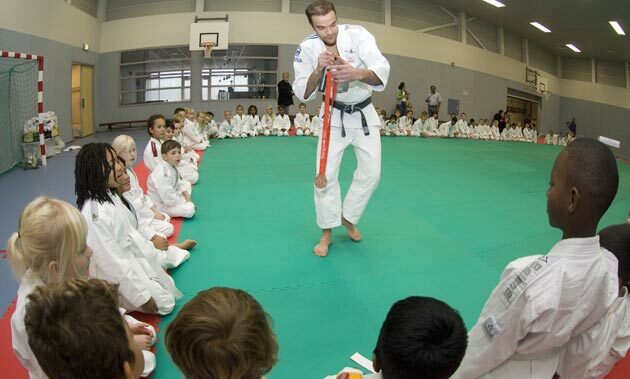 World Champion in 2007 (Rio - 60kg) and Olympic Medallist in Beijing 2008, Ruben Houkes from the Netherlands, is today totally involved in the Judo for Children Program. Olympic Bronze medalist '08 and world champion Ruben Houkes (the Netherlands) was inspiring hundreds of young children the last few days pior to the first edition of the World Judo Day. With a great final on Friday 28th, where over 600 children received there final judoclinic from Ruben, the dutch school program Schooljudo.nl has contributed to the judo spirit of world Judo Day. In the city of Rotterdam and the surrounding cities over 40 primary schools have had a six weeks judo program at school. This special developed program for primary school focusses not only on judo itself, but also on the educational values that are as important as the sport dimension during the course. With fun judo exercises, children learn how to respect each other, and the lessons contribute to improve there social behavior. Subjects as working together and resilience are implemented in the course as well. The first phase of the 6 weeks school ends with a real judo party for the children. They get a clinic of the the ambassador of the Schooljudo.nl program. After this session there will be an other six weeks course after school time. Which will start in de coming week. Schooljudo.nl has initiated over 60 programs (schools) after the summer holidays, and the first period of this school year will come to its end soon. Over 6000 children participated in this first period and next period will start off with an other 70 programs and again over 7.000 children will be inspired through the Schooljudo.nl program. During this school year, Schooljudo.nl will organize (sep '11 to jun '12) over 400 programs across the Netherlands, with an estimation of 30.000 children who will be participating. About 100 clubs and judo teachers will make there contribution by giving all the lessons at and after school time. Schooljudo.nl is an approved program by the IJF and is one of the Judo for children program examples. The judo for children program wants to contribute to a better society throughout the world. Judo is a perfect sport to add social and educational skills to the youngsters, which will be passed on towards friends, family and local society. This way judo doesn't only contribute in physical way but also at the social and educational level.